It is important to thoroughly prepare your boat for travel. This will help ensure that it arrives at its destination in pristine condition. Secure everything down and identify any pre-existing damage before your transporter loads your boat. This will prepare you for the unlikely event that your boat is damaged in transit. If you cannot prepare the boat yourself, you can have a qualified boat yard do so. It is also advised that you have it inspected by a licensed marine surveyor. You should have your boat prepped for pick-up before the transporter arrives. If possible, be prepped early just in case the transport company needs to come a day early for weather or any other reasons. Before dismantling anything on your boat, take photos so that you have something to reference when reassembling the boat after the transport. Then, remove all personal items from your boat. Clean your boat’s exterior and inspect for any damages. Make a list of any problems found and take date-stamped photos. The driver you hire will also run an assessment with you for your Condition Report. Pick a marina or boatyard as a loading spot that has a 14′ clearance, so that branches and wires will not interfere with your boat at the beginning of its trip. Secure all loose gear above and below deck. Close and secure any hatches by tying or taping them. If they leak, seal them to avoid any possible water damage. Cabin windows also need to be latched and taped from the outside. Drain all fuel and water tanks (some companies say to drain until 1/4 full, others want them completely empty), and remove any drain plugs from the hull. To avoid damage during the winter months, all water systems, pumps, and air conditioners, etc. should be drained of any water. Disconnect batteries, and secure the cables away from it to prevent any contact. Remove any valuable electronics and anchors from the deck, pad and secure what you can in the cabin. The same goes for any windshield or Plexiglas that protrudes over the flying bridge. In the case of something large, such as a dinghy or any superstructure, secure it on board and make sure it is well-padded. 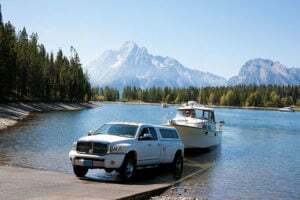 If your boat has a radar arch or fly-bridge which causes it to load out higher than 13 Feet 6 Inches, they will need to be removed, padded and secured to the boat. Damage or loss of these external items does not fall under the service provider’s responsibility. Once everything is secured below, lock the cabin and keep the key during travel. 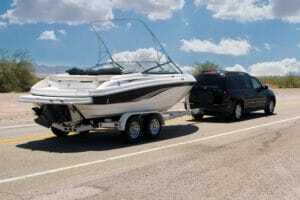 Transporters will not be held responsible for any damages caused by your failure to properly prepare the boat, including damage caused by boat coverings or shrink wrap. Consult with your specific transporter for any questions about this. Professional boat transporters will be able to advise you on these matters before transport. Remember, your boat will be experiencing stronger winds than it is used to, so expect it to arrive with normal travel wear and dirt from the roads. The keel of a sailboat will often give the appearance of some separation from the hull, but keep in mind this is just minor cracking in the paint or sealant. Your mast will be secured to the trailer, not on your boat. Be sure it is secured on carpet at the spots it is tied down, if not completely wrapped in carpet, to help avoid paint scratches. Be forgiving of paint cracks and wear in these areas; it is close to impossible to avoid them due to the chafing from road vibrations. As previously mentioned, some disassembling and rearranging of the sailboat may be necessary in order to reach the desired traveling height. If you are transporting a wooden boat, prepare it against drying out by coating it with linseed oil. It is also advisable to transport wooden boats in their own custom cradle, because these are made to spread the boat’s weight properly.